I enjoy restoring these pens and am always looking for some interesting variants and less common styles. This week’s pen fits these categories. While not extremely rare, the Star Clip Vacumatics are an interesting slice of Parker history. Below is the exploded view of this pen. As you can see, it has the pre-war aluminum speedline filler and doule jewels, consistent with a Second Generation Vacumatic. All of the parts are in good working order, except the filler needs a new diaphragm. General cleaning is also needed and as usual, the barrel needs to be cleaned to remove all signs of the old caked-on diaphragm. I polished the nib (a Parker Vacumatic Fine) as well as the cap bands and clip thoroughly, including a bath in the Ultrasonic Cleaner. I then spent a considerable amount of time removing all of the old diaphragm from the barrel. This is very important to assure a clean fit for the new diaphragm and filler unit which will allow for correct operation of the restored pen. Make certain to check several times with magnification to see that there is no rubber left in the barrel before rebuilding the filler and inserting it back into the rear of the pen. I also cleaned the cap, which usually has years of old ink caked to its inside. The breather tube was checked for clogs and tip wear and it was fine. I did clean it and blow through to make sure any residual ink was gone. The same was done to the feed and its channels. Once everything was cleaned, I attached a new debutante diaphragm to the filler and, using my vac tool, reinserted it into the rear of the pen, making sure it was sealed and the blind cap fits securely. Before putting the reassembled nib/feed/section back on the front of the barrel, I used a goose neck mini-light to check that the diaphragm was seated correctly in the barrel and that there was suction when the aluminum speedline filler was pressed. After this was done and it was determined that it was properly functioning, I screwed the nib/feed/section back into the pen. I then polished the barrel, cap, and blind cap. Then the clip was secured back on the cap using the clip screw and the pen is complete. Below are two photos of the completed pen ~ a 1940 Vacumatic Junior. The pen measures 5 1/8 inches closed and 6 inches posted. The date code is a 0 surrounded by three dots, which indicates it was produced in Janesville, WI during the first quarter of 1940. As mentioned before, three dots denotes first quarter production, 2 dots is for the second quarter, 1 dot for the third quarter, and no dots around the date indicates the fourth quarter of the year. Here is a close up of the Star Clip. Pen historians point out that Parker decided in the late 1930s that they needed to offer a lifetime guarantee to compete with Sheaffer’s guarantee. The Star on the Clip was the idea for the indicator on the Vacumatic of a Lifetime Guarantee. In 1939, this was quickly changed to the more familiar and long lasting Blue Diamond that is seen on Vacumatics after this time. Star Clips that were already produced were used on pens after 1938/9, but did not necessarily denote a lifetime guarantee. It is believed they were just used until the supply was used up. Thus, they are not as plentiful and an interesting variant on Vacumatics during the 1938-40 period. I have also read that they are often seen on Shadow Wave Vacumatics of this period. 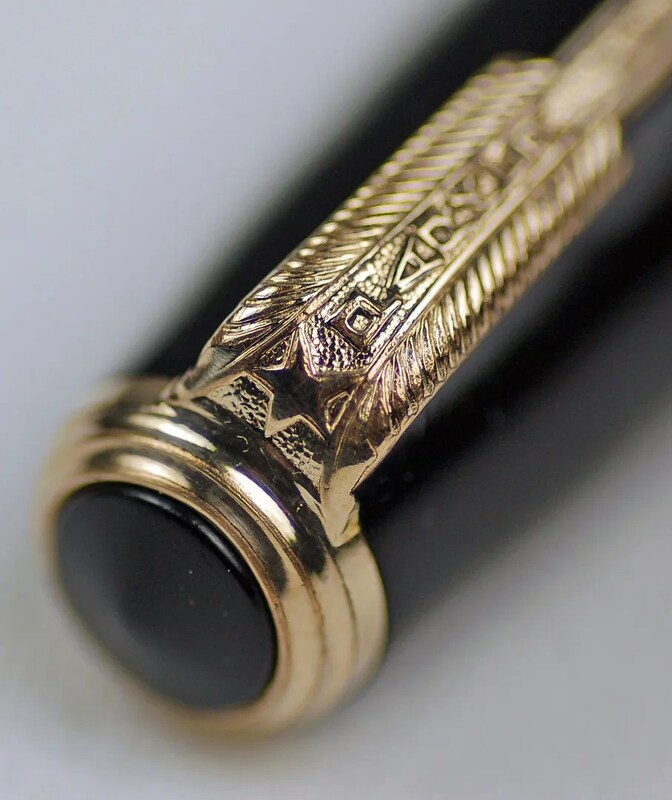 This pen, with it 1st Quarter of 1940 would seem the perfect representative for the Star Clip ~ a pen produced in late 1939, early 1940 that was not a Lifetime Guarantee pen. Another item that makes this pen a bit unique is the barrel. It appears to have longitudinal stripes, which did appear in some vacumatics of this period, though not too frequently. Below is a photo which attempts to capture their spacing. It seems that there are endless variations on this very popular line of Parker Pens. I guess that is what draws many collectors to them. Around every corner of an antique store, or estate sale, may lie a Vacumatic one hasn’t seen before. *For further information on Parker Star Clips, see the book Parker Vacumatic, by Geoffrey Parker, David Shepherd, and Dan Zazove .. pages 149 and 154.